They offer “All Road,” “Gravel,” and Off-Road tires, including two new gravel offerings, the 38c Cannonball and 32c Galenda. The Galena, which is name of the main ore of lead, spots a file tread-like profile and is billed as ideal for “packed gravel.” It comes in two versions, the standard and the premium. The standard Galena is 60tpi and has a puncture protection belt under the tread, with a claimed overall weight of 315g. The premium version is 120tpi and the puncture protection strip runs from bead to bead. As a result, the Galena premium has a higher claimed weight of 320g. On our in-house scale the Galena premium came in at 339g. The Cannonball, the official tire of the Dirty Kanza 200 and sold as suited for “coarse gravel,” is a heavier duty offering that also has a file tread, although it has more chevrons down the center tread compared to the Galena. 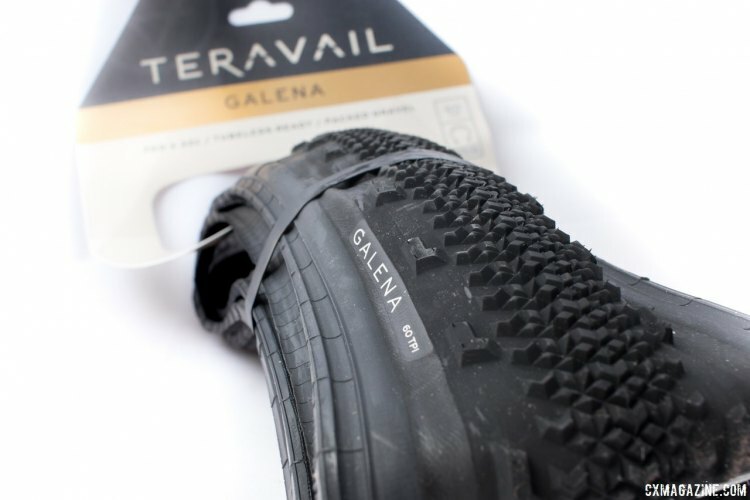 Like the Galena, it also comes in two versions, a standard and a premium, with the same tpi and puncture protection distinctions between the two as with the Galena offerings. The standard Cannonball weighs 510g on the Cyclocross Magazine scales, with a claimed weight of 500g, while the premium version has a claimed mass of 510g. The tires are made in Japan, which suggests they’re likely made by Panaracer, like the excellent 42c Soma Cazadero and Bruce Gordon Rock ‘N Road, or perhaps by IRC. Both the Galena and Cannonball tires are sold as tubeless-compatible. The Cannonball 38c tire’s bead isn’t super tight, and it is easily installed on a Stan’s NoTubes Grail rim without tools. This makes set-up quick and easy with a compressor or charging pump, but a lot more difficult if you just have a floor pump. In our experience, the looser bead also probably indicates it’s not an ideal choice for Road Tubeless-certified rims. But with a Bontrager Flash pump, it snapped pretty easily into place on the Grail rim.